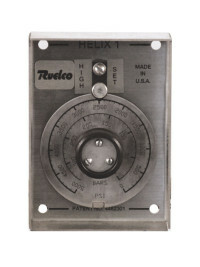 The Ruelco Helix Dial Pilot is a bourdon tube type pressure switch. The Helix is designed to have good overpressure protection as well as a small dead band. The pressure is adjusted by means of the external dial. Supplied as a high or low, the coiled bourdon tube is used as the pressure sensing element. This eliminates any soft goods from coming into direct contact with the process fluid. The coil will activate a snap acting block and bleed valve when a high or low set point is reached. All pressure switches are factory calibrated used 30 PSI pneumatic signal and come in a variety of ranges from 0 – 15,000 PSI. 316 S.S. construction (models to NACE MR0175 available). Sensing ranges from 0 to 15,000 PSI. Block and bleed pneumatic valve. Viton seals are utilized for dependability.